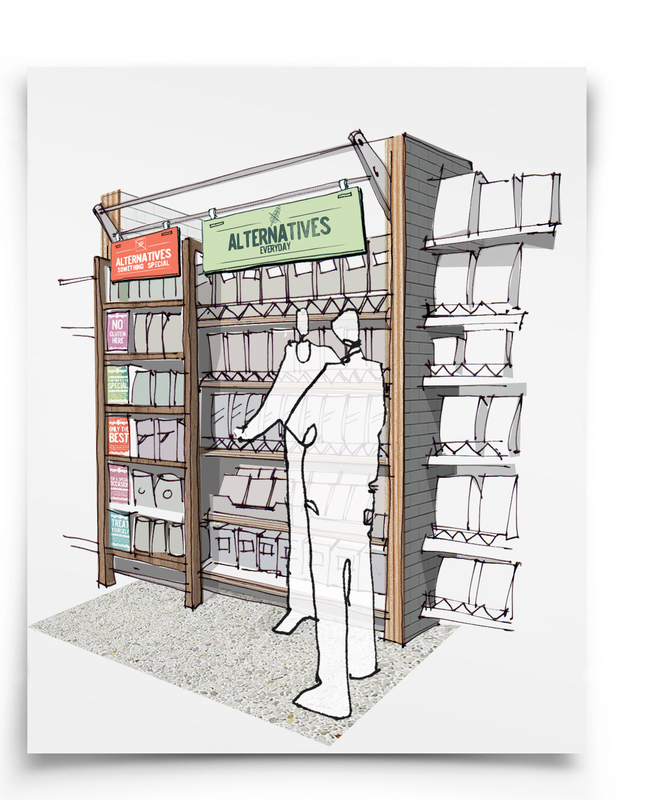 Leading trade magazine, The Grocer, recently called on our expertise in retail design to reimagine the home baking aisle. From scratch. It was a big job, but it afforded us the rare opportunity of analysing an entire category’s DNA and then rebuilding it. The home baking aisle can be tricky to navigate given the many subcategories – and the sheer volume of ingredients on offer. How could it be better structured? It doesn’t do enough to inspire and engage and get people baking. Instead, retailers tend to rely on shows such as The Great British Bake Off (GBBO), adverts and food magazines to drive sales. A huge range of ingredients are sold within the category. This can lead to ingredients being wasted when they are used once and then neglected at the back of a store cupboard in the home. How can this waste issue be addressed? With a greater focus on provenance and origin, how can origin play a bigger role in home baking? Where next for ‘free from’ ingredients? Baking has always been a competitive profession and hobby. Bakers compete for local custom, local village fête cake bakes can be a thing of fierce rivalry, and in recent years GBBO has taken things to a whole new level. How do we introduce a competition element into the aisle? 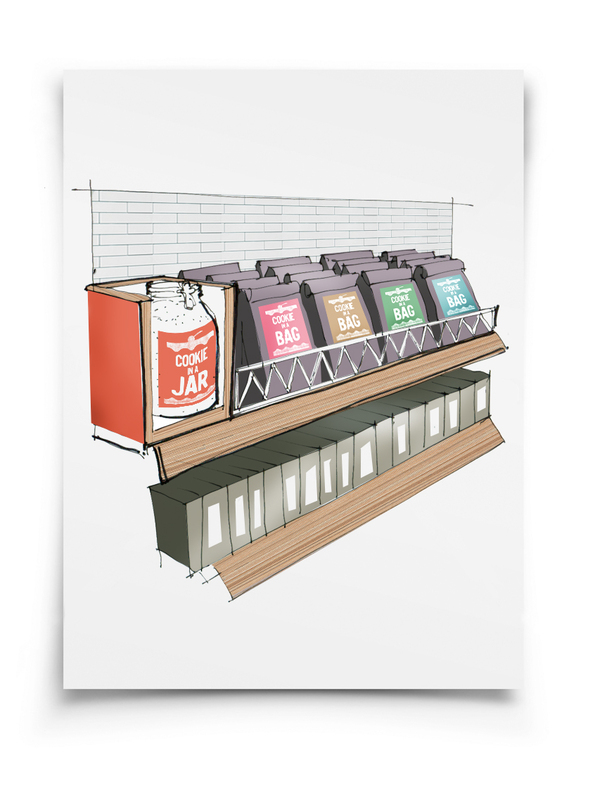 This merchandising concept features silos containing commonly used ingredients, allowing shoppers to measure and pay for only what they need for their recipes. 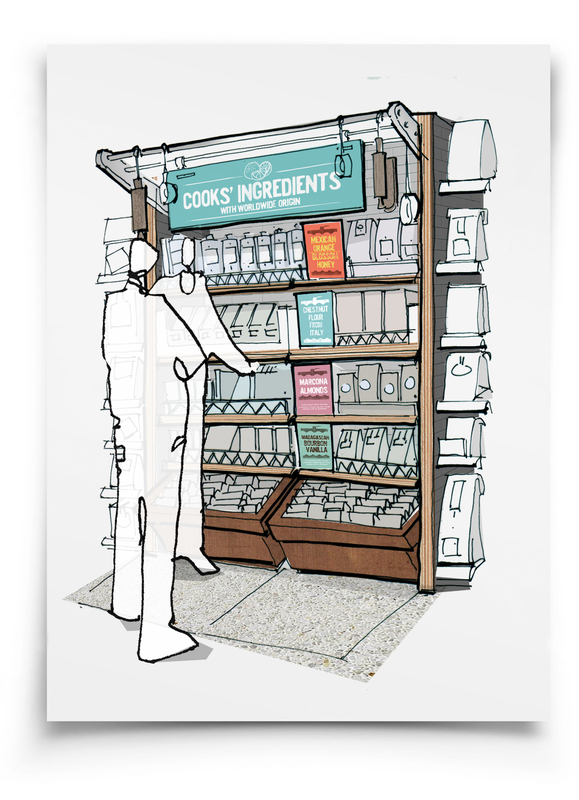 This area merchandises premium baking ingredients / ingredients with provenance for the home cook who is after something a little bit more special. Visitors to this fixture don’t just want almonds, vanilla essence and honey. They’re willing to pay a little more for Marcona Almonds, Madagascan Bourbon Vanilla and Mexican Orange Blossom Honey to make their baking that little bit extra special. We recognise the growing appeal of ‘free from’ ingredients as a lifestyle choice for those not diagnosed with an allergy. Meanwhile, ‘free from’ as a category descriptor could arguably do with updating. We therefore chose to badge the ‘free from’ area ‘alternatives’ to appeal to a wider audience. We’ve also sub-categorised the fixture into ‘everyday’ and ‘something special’. The ‘everyday’ section contains typical, everyday ‘free from’ products such as gluten-free flour whereas the ‘something special’ area showcases premium ‘free from’ ingredients. 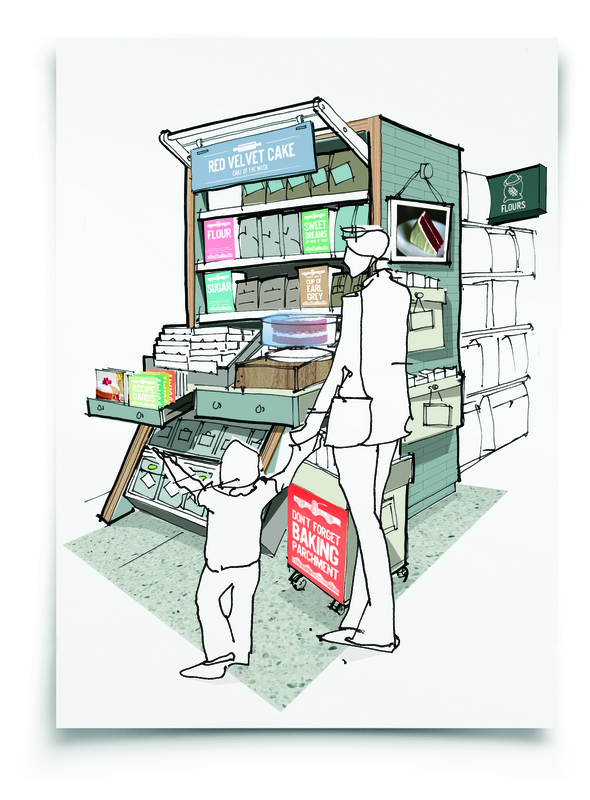 We have designed a dedicated area of the aisle in which to merchandise bake mixes – both sweet & savoury – specifically aimed at those who like home baking but perhaps don’t have the skills or confidence to bake from scratch. These are mixes where there is generally just one or two ingredients to add, like water, egg, or oil. Put the ingredients listed into your basket or trolley. Pay at the checkout & take home. The aim would be to get members of staff involved too through baking the showpiece cake and staff room tastings. We’ve considered how the home baking category can tap into wider societal trends, such as social media and personalisation. 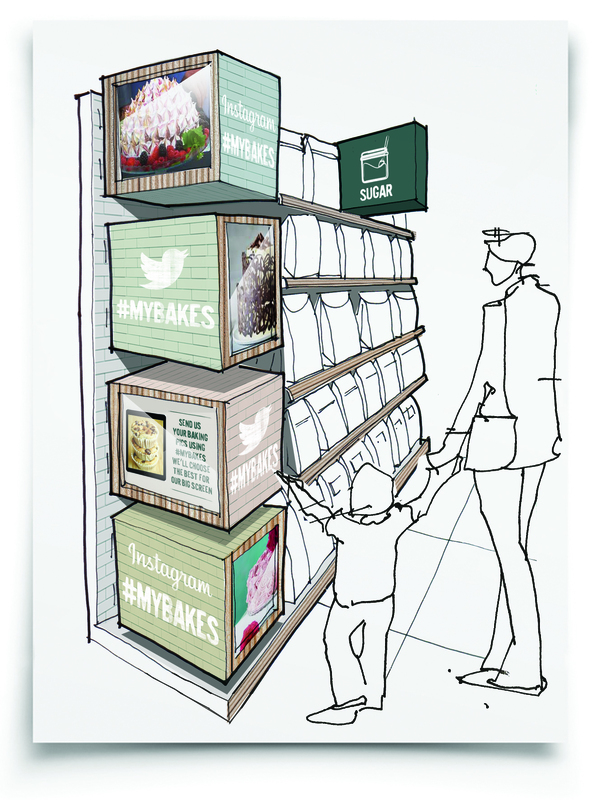 #MyBakes is a key initiative to allow retailers to connect with shoppers and the local community. Customers are encouraged to tweet or upload to Instagram a picture of their home baking efforts, using the #MyBakes hashtag. The best images would be shown on tablet computers within the aisle and the best one overall, as chosen by the store manager, would appear on a larger screen elsewhere, alongside the baker’s name, age and where they live. Everyone loves ‘pick n mix’. And it’s not just about sweets – it’s being used across multiple categories now. 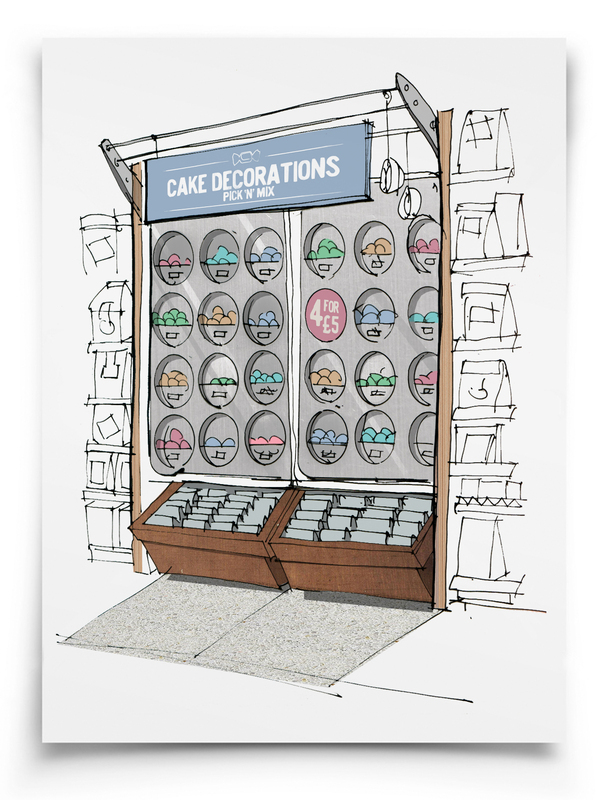 To help the home baker economise, we’ve come up with a pick ‘n’ mix unit where each hole contains little cupcake-shaped pots containing small quantities of cake decorations. It means home bakers don’t need to buy a large pot of any one decoration. A 4 for £5 offer means they can choose a few different ones or they could choose multiple types of the same one. If you’d like to feed back to us on what you think of our designs, or you’d like to discuss how we might help you with any of your retail or graphic design needs, feel free to contact Rich Ford, our Director of New Business on rich@sherlockstudio.co.uk. 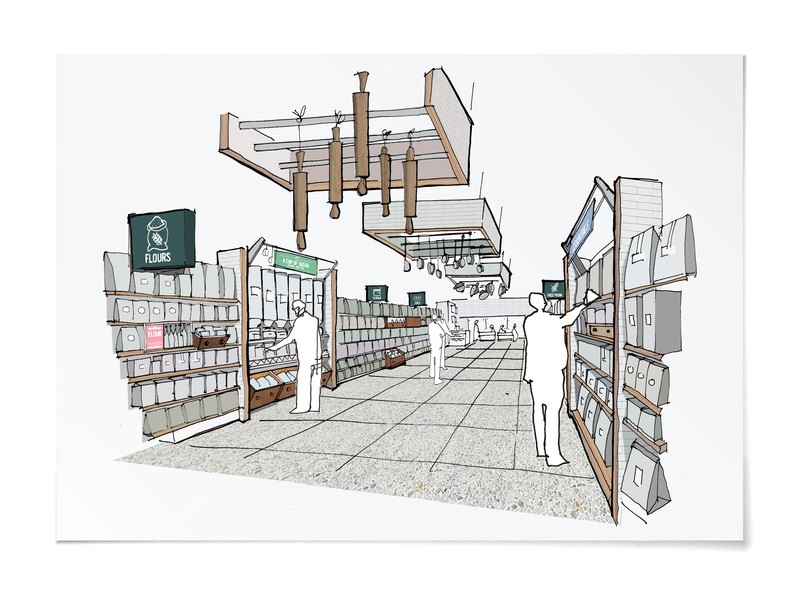 You can view The Grocer article featuring our designs here (£).